Ahhh! WonderCon starts today! 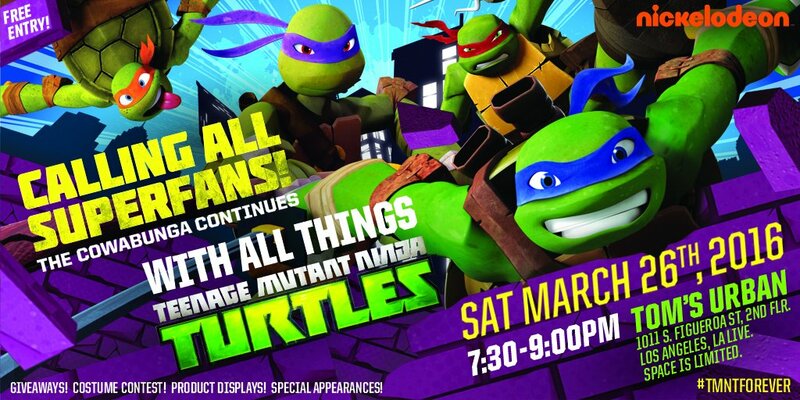 Alas, I won't be there, but there's an impressive schedule of events for TMNT fans who will be, so let's take a look! Visit the booth throughout the weekend to support both the upcoming movie and the Nickelodeon animated series. Check the booth for a schedule of events, including autograph signings and, importantly, ticket distribution times for autograph signings. You can also pick up a wristband to attend a FREE TMNT party on Saturday night! Paramount Pictures and Nickelodeon Movies provide an inside look at the next installment in the Teenage Mutant Ninja Turtles franchise. Attendees will hear the latest news for one of the summer's most anticipated movies! It is a golden age to be a geek, with a new Star Wars movie every year, multiple Marvel movies, the cinematic Justice League forming, and more Teenage Mutant Ninja Turtles. Not to mention all of the TV projects like The Walking Dead, The Flash, Powers and Arrow! With those projects come toys and collectibles! Bill Benekie (Mattel), Jim Fletcher (DC Collectibles), Kevin Kiniry (DC Collectibles), Dan Lujan (Kotobukiya), Scott Neitlich (Jakks Pacific), and Jeff Trojan (Playmates Toys) discuss how they are handing product production and security for some of the biggest movies and license of all time. Moderated by Daniel Pickett (Action Figure Insider, Geek Shall Inherit podcast). The Turtles are back! Spend some time with the mutated minds making Nickelodeon's hit animated TV series, now in its fourth season. The panel features executive producers Ciro Nieli and Brandon Auman as they provide sneak peeks into season 4 and discuss the epic and bizarre adventures in store for the Turtles. Fans will also get an exclusive look at an upcoming new episode "Trans-Dimensional Turtles," in which the Turtles collide with their '80s counterparts. Watch the episode for very special cameos! Also on hand will be the extraordinary and talented voice actors of TMNT.